André Vitchek is a Russian-born American political analyst, journalist, and a filmmaker who has lived in the US, Chile, Peru, Mexico, Vietnam, Samoa and Indonesia. He has covered armed conflicts in Peru, Kashmir, Mexico, Bosnia, Sri Lanka, Congo, India, South Africa, East Timor, Indonesia, Turkey and the Middle East. He has traveled to more than 140 countries, and has written for Der Spiegel, Asahi Shimbun, The Guardian, ABC News and Lidové noviny and appeared on various television and radio shows including France 24,] RT, China Radio International, The Voice of Russia, Press TV, CCTV, Ulusal Kanal (Turkey), Al-Mayadeen (Pan-Arabic network), Radio Pacifika, and Radio Cape, among others. This conference will be marking 70 years of war-making by the North Atlantic Treaty Organization and 70 years of working for peace by the World Peace Council. The keynote address will be by André Vltchek, noted journalist, author, film-maker, globe trott’er, critic of NATO and Western interventionism and contributor to Global Research. 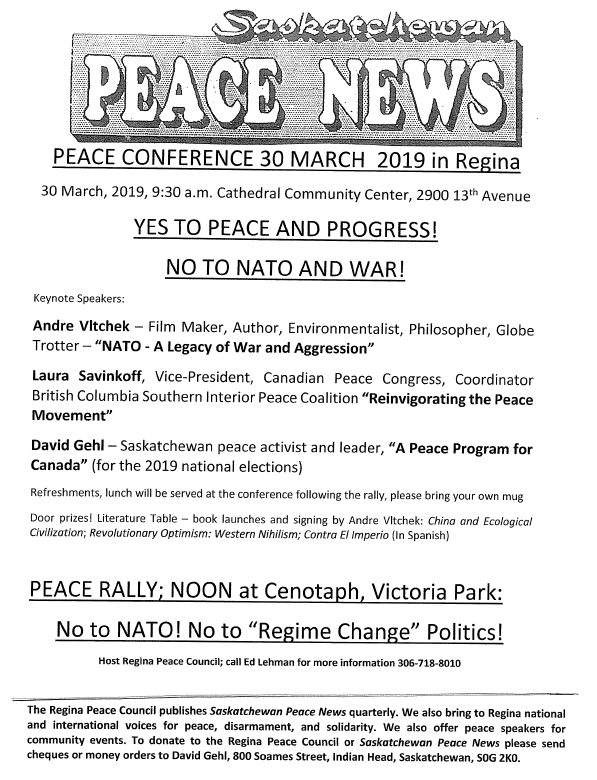 The conference will also be addressed by Laura Savinkoff, Vice-President of the Canadian Peace Congress, and David Gehl, local peace activist/leader. At noon there will be an anti-NATO rally in Victoria Park. 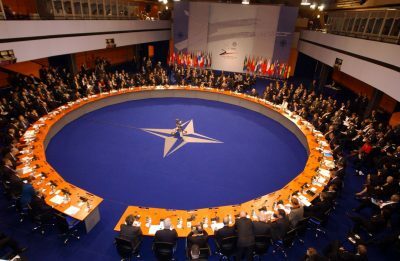 The North Atlantic Treaty was signed on April 4, 1949, giving rise to the North Atlantic Treaty Organization or NATO. The mission of the original 12-member military alliance was to oppose the Soviet Union. With the dissolution of the USSR on December 26, 1991, one might wonder why NATO still exists, much less why it has grown to 29 members including some which are far removed from the north Atlantic. Please join us for a public forum on the role of NATO and the threat it presents to world peace. Our keynote speaker is journalist André Vltchek. His presentation will be followed by a question and answer session.